For excellent patient education resources, visit eMedicineHealth's First Aid and Injuries Center. Also, see eMedicineHealth's patient education articles Broken Ankle (Ankle Fracture) and Ankle Sprain. The distal tibia, distal fibula, and talus bones make up the ankle joint. These 3 bones are bound together by the joint capsule and surrounding ligaments. 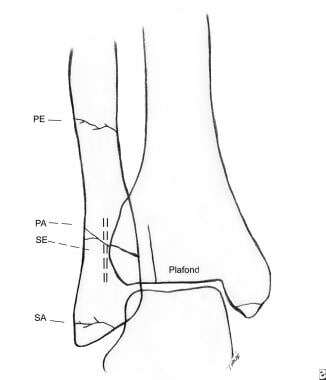 The anatomic relationship of the tibial plafond (joint surface of the distal tibia) to the talus is important for ankle stability. Because the anterior portion of the talus is more broadly shaped, dorsiflexion increases bone surface contact, thus improving stability. This relationship causes decreased stability during plantarflexion, accounting for the vulnerability to ligamentous injuries when the foot is plantarflexed. See the image below. Diagram showing the typical locations for ankle fractures occurring from the 4 major injury mechanisms (SA= supination adduction, SE= supination external rotation, PA= pronation abduction, PE= pronation external rotation). Note that the SE fracture is shown as a dashed line, since it is best seen in the lateral projection. Forces acting on the ankle lead to typical fracture or ligamentous patterns. Determining the position of the ankle during the injury can assist in assessing for ligament stability. Although simple unidirectional forces can be involved in an ankle injury, multidirectional forces are usually involved, making diagnosis a challenge. Most unstable ankle fractures are the result of excessive external rotation of the talus with respect to the tibia. If the foot is supinated at the time of external rotation, an oblique fracture of the fibula ensues. If the foot is pronated at the time of external rotation, a mid- or high-fibular fracture results. The lateral complex consists of the distal fibula, the lateral facet of the talus, and the lateral collateral ligaments of the ankle and subtalar joints. Lateral malleolus injury (most common type of fracture involving the ankle) typically occurs with supination external rotation forces. The inversion force first strains the lateral ligament complex or avulses (transverse fracture) the lateral malleolus. With continuation of this force, the talus impacts the medial malleolus, causing an oblique fracture of the distal tibia. Inversion ligamentous injuries of the ankle are the most commonly observed soft-tissue trauma in sports. Posterior malleolus injury typically occurs with a supination-external rotation or a pronation-external rotation injury and represents avulsion of the posterior tibiofibular ligament from the posterior distal tibia. Kaplan LD, Jost PW, Honkamp N, Norwig J, West R, Bradley JP. Incidence and variance of foot and ankle injuries in elite college football players. Am J Orthop (Belle Mead NJ). 2011 Jan. 40(1):40-4. [Medline]. Czajka CM, Tran E, Cai AN, DiPreta JA. Ankle sprains and instability. Med Clin North Am. 2014 Mar. 98 (2):313-29. [Medline]. Mulcahey MK, Bernhardson AS, Murphy CP, Chang A, Zajac T, Sanchez G, et al. The Epidemiology of Ankle Injuries Identified at the National Football League Combine, 2009-2015. Orthop J Sports Med. 2018 Jul. 6 (7):2325967118786227. [Medline]. Newman JS, Newberg AH. Basketball injuries. Radiol Clin North Am. 2010 Nov. 48(6):1095-111. [Medline]. Michelson JD. Fractures about the ankle. J Bone Joint Surg Am. 1995 Jan. 77(1):142-52. [Medline]. [Full Text]. Thordarson DB. Detecting and treating common foot and ankle fractures. Part 1: the ankle and hindfoot. Phys Sportsmed. Sept 1996. 24(9):29-38. [Full Text]. Clanton TO, Porter DA. Primary care of foot and ankle injuries in the athlete. Clin Sports Med. 1997 Jul. 16(3):435-66. [Medline]. Miller TL, Skalak T. Evaluation and treatment recommendations for acute injuries to the ankle syndesmosis without associated fracture. Sports Med. 2014 Feb. 44 (2):179-88. [Medline]. Tayeb R. Diagnostic value of Ottawa ankle rules: simple guidelines with high sensitivity. Br J Sports Med. 2013 Jul. 47(10):e3. [Medline]. Tandeter HB, Shvartzman P. Acute ankle injuries: clinical decision rules for radiographs. Am Fam Physician. 1997 Jun. 55(8):2721-8. [Medline]. Schwartz DT, Reisdorff E, Williamson B, eds. Emergency Radiology. New York, NY: McGraw-Hill; 1999. Yu JS, Cody ME. A template approach for detecting fractures in adults sustaining low-energy ankle trauma. Emerg Radiol. 2009 Feb 18. epub ahead of print. [Medline]. Robertson GA, Wood AM, Aitken SA, Court Brown C. Epidemiology, management, and outcome of sport-related ankle fractures in a standard UK population. Foot Ankle Int. 2014 Nov. 35 (11):1143-52. [Medline]. Del Buono A, Smith R, Coco M, Woolley L, Denaro V, Maffulli N. Return to sports after ankle fractures: a systematic review. Br Med Bull. 2013. 106:179-91. [Medline]. Leontaritis N, Hinojosa L, Panchbhavi VK. Arthroscopically detected intra-articular lesions associated with acute ankle fractures. J Bone Joint Surg Am. 2009 Feb. 91(2):333-9. [Medline]. Zalavras CG, Christensen T, Rigopoulos N, Holtom P, Patzakis MJ. Infection following operative treatment of ankle fractures. Clin Orthop Relat Res. 2009 Feb 19. epub ahead of print. [Medline].